Below is a description of each of the documents you need to register and drive a vehicle in Goma. At the bottom of the page you will find a map to show you where to buy each document. If you need help, I suggest you call Mustafah (former mechanic at Honda in town) at +243 810 636 657. 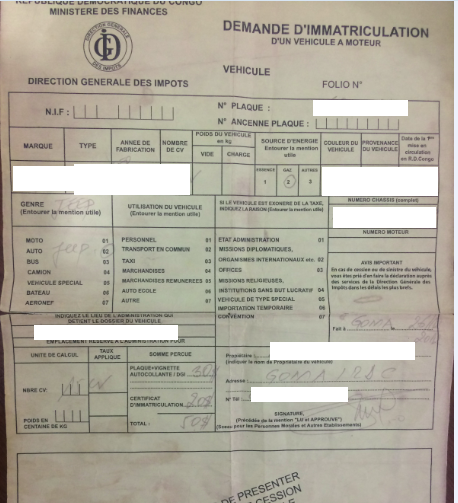 The “demande d’immatriculation” is your vehicle’s registration and provides you with a licence plate. It costs $170 for a car or $40 for a motorbike. You can buy it at Direction Generale des Impots (DGI) close by the Tchukudu roundabout. Show proof of purchase. 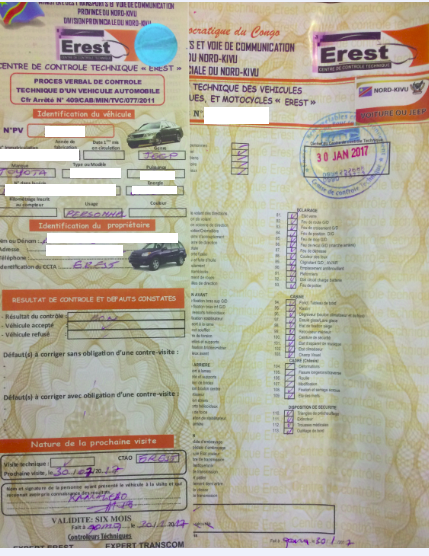 The “controle technique” is a document certifying that your car is in a proper state to be driven. It’s $35 for six months. You get at Erest, close by the Signers roundabout. Contact: http://www.erestrdc.org; garage@erestrdc.org, erestrdc@yahoo.fr; +243 994 252 688, +243 990 473 173, +243 896 366 430. The “vignette” is your permit to use Congo’s roads. It’s $36 for a small car or $51 for a jeep, incl. a Rav4. You get it at DGR-NK. SONAS is your car’s insurance. It’s $110 for six months for a small car, $145 for six months for a jeep, incl. a Rav4 and $375 for a landcruiser. If you go to SONAS in Katindo you’ll get the insurance for six months; SONAS opposite of Au bon Pain only offers insurance for 12 months. COMESA is your insurance to drive in the Common Market for Eastern and Southern Africa. The countries in dark green above are the current COMESA member states. It’s $61 for one year for a landcruiser at SONAS. The “permis de conduire” is your driver’s licence. It’s $25 for one year and can be bought at the major’s office. Be aware that they usually ask expatriates for $50 but you can and should negotiate it down to $25. Bring a passport photo. Alternatively, you can request a licence for five years for $75 in Kinshasa (last two pictures above).